It is very hard to write a spoiler-free review for Thomas More’s Utopia. It really doesn’t have a plot. Besides, most people already know a thing or two about the island of Utopia. More coined the term “Utopia”, which we use on an almost daily basis. So, rather than write a review for Utopia, I have decided to write a reflection on some of the themes in the book. There is no scholarly consensus on how Utopia should be read and interpreted. 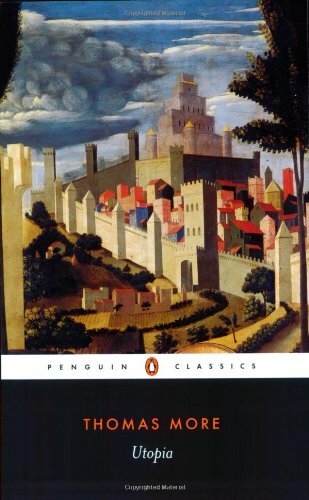 Paul Turner who wrote the introduction to the Penguin edition thinks Thomas More agrees with Utopian values, but I believe that Utopia is a satire. I believe that More wrote Utopia to expose the weaknesses of every philosophical and social system ever conceived or implemented. For starters, the names in the book are completely nonsensical. Utopia literally means “No Place”. The narrator Raphael Hythlodaeus has “dispenser of nonsense” as a last name. The list goes on and on. The preface to the book is a letter from Thomas More to Peter Gillis (a personal friend and printer at Antwerp) claiming that More and Gillis met Raphael during one of More’s trips to Antwerp. More and Gillis never learned from Raphael where Utopia is located on the map, even though they know it exists somewhere in the Atlantic. In the letter More wants Gillis to ask Raphael again where the island is located so others can visit it and learn from the virtues and policies of the Utopians. But is the island of Utopia really a utopia? Would anyone really want to live in such a society? The reason why I can’t take the book seriously is that the laws of the land are not consistent. The Utopians also create policies that are selfish and irresponsible. They have adopted a diverse array of social policies that are frankly incompatible with one another. Often, one policy contradicts another policy. I was able to identify the beliefs or systems More described (nominalism, epicurianism, communism, religious tolerance, democracy, the mercenary system, etc). The hiring of foreign mercenaries, in particular, made me question the integrity of the Utopians. In the 15th and 16th centuries, the Swiss Confederation hired out their own citizens as mercenaries to fight for foreign nations (the Swiss Guards were a product of this system, hired by Pope Julius II in 1503 to fight in his wars). The mercenary system benefited the Swiss Cantons financially, but many young men died fighting for foreign nations rather than for their own nation. The system was condemned by many for political and religious reasons. It undermined Swiss nationalism and was seen as unethical. The Utopians do not fight their own wars because they do not want any of their citizens to suffer. Instead, they hire foreign mercenaries to fight the wars for them. That strikes me as both irresponsible and unethical. So most of their fighting is done by mercenaries. They recruit them from all over the world but especially from a place called Venalia, which is about five hundred miles to the east of Utopia. The Venalians are extremely primitive and savage – like the wild forests and rugged mountains among which they grow up […] These people will fight for the Utopians against any nation in the world, because no one else is prepared to pay them so much. You see, the Utopians are just as anxious to find wicked men to exploit as good men to employ. So when necessary they tempt Venalians with lavish promises to engage in desperate enterprises, from which most of them never come back to claim their earnings. (93-94). The Utopians do not keep their end of the bargain. The final reason why I think Utopia is a satire is that the author’s life was nothing like a Utopian’s. Thomas More was far from a tolerant person. Although he denied having tortured Protestants, as Lord Chancellor, he was involved in the execution of at least two. More wrote thousands of pages of vitriolic polemics against William Tyndale and Martin Luther. He approved of executing heretics by burning at the stake and even expressed pleasure at watching one Protestant’s execution. More had many positive characteristics (he educated his wives and children, and despite his questionable political career, was a man of integrity), but he was not a tolerant individual. He thought religious pluralism was a threat to the State. It should be noted, however, that most people in the 16th century thought it was perfectly acceptable for the State to execute religious dissenters. Thomas More may have been a “man for all seasons” but he was also a man of his own age. And I’ve no doubt that either self-interest, or the authority of our Saviour Christ – Who was far too wise not to know what was best for us, and far too kind to recommend anything else – would have led the whole world to adopt the Utopian system long ago, if it weren’t for that beastly root of all evils, pride. For pride’s criterion of prosperity is not what you’ve got yourself, but what other people haven’t got. Pride would refuse to set foot in paradise, if she thought there’d be no under-privileged classes there to gloat over and over about – nobody whose misery could serve as a foil to her own happiness, or whose poverty she could make harder to bear, by flaunting her own riches […] But as this fault is too deeply ingrained in human nature to be easily eradicated, I’m glad that at least one country has managed to develop a system which I’d like to see universally adopted. The Utopian way of life provides not only the happiest basis for a civilized community, but also one which, in all human probability, will last for ever. They’ve eliminated the root-causes of ambition, political conflict, and everything like that (112-113). But have they really? If pride is the root of all injustice and humans are naturally selfish and prideful, will a change of social structures rid the world of injustice? As has been demonstrated, the Utopians’ war policies are not exactly selfless. Utopia reads more like Gulliver’s Travels than The Social Contract. The Augustinian ending exposes the work as a full-blown satire. This year is the 500th anniversary of the publication of Utopia in Latin. There has never been a better time to read this work. If you have read it, I am interested in reading your thoughts.